Enjoy lots of creative play with your children with this super easy salt dough recipe. The kids will be occupied easily for a few hours and they can also paint the shapes to make thoughtful gifts. Mix one cup salt with two cups flour and now gradually add one cup of water. Add water slowly and keeping mixing. Now knead into a dough shape. My kids always have a great time playing around with the dough before we get ready to make shapes. Once the dough is ready, you can have lots of fun forming fun shapes. You can use cookie cutters for the purpose also but they are not necessary. 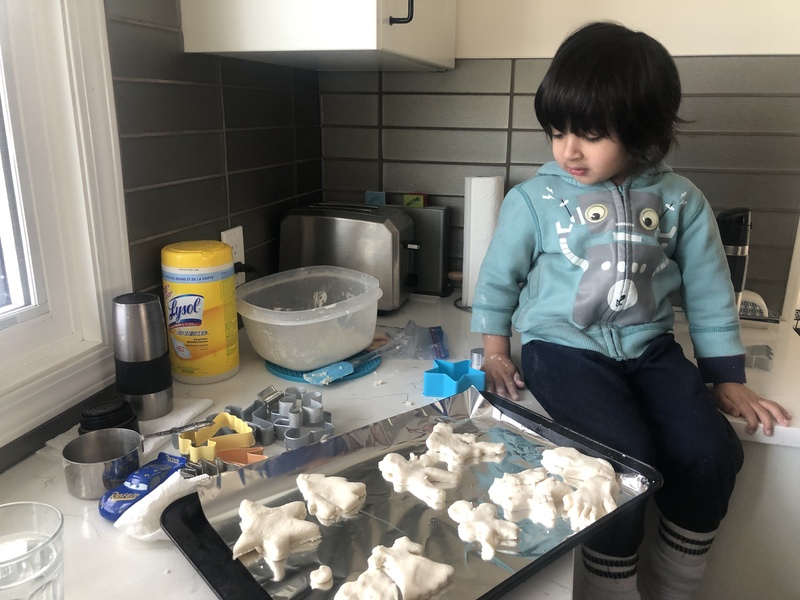 We have seen families make the most adorable tea sets from salt dough, so imagination is the limit! Preheat the oven to 250F. Place all your shapes on a baking sheet and place in the oven. Bake for 2 hours until they are hard and dry. Let the shapes cool down after you take them out of the oven. You can paint the shapes to customize your creations. You can either use paints or just markers. Let your kids get creative and let them take ownership for their creation. I always like to see originality and uniqueness in the crafts my children make rather than perfection. So, they might not be Pinterest perfect, but I know for sure that my children own their crafts as their own and had a great time creating them. Below is a heart Zeynab made specially for valentines for me and I love it! Have you tried making salt dough at home? Would love to hear from you!